Showing up to a Rosh HaShanah or Yom Kippur service without preparing makes for especially long days. There is a lot of liturgy. Pages and pages of it. And in many places, the services are passive experiences. Just sitting and listening to a lot of chanting and what sounds like mumbling. 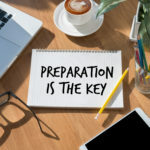 The days and weeks ahead of the High Holy Days are meant to provide us with preparatory time so that we don’t show up to synagogue unprepared. One practice is the daily blowing of the shofar, except on Shabbat, at the conclusion of morning prayers. It continues throughout the month until the day prior to Rosh HaShanah. The shofar is a clarion call to conscience. 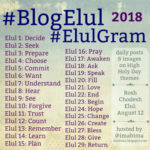 Hearing it repeatedly during Elul primes our soul and readies us to make atonement. Psalm 27 is traditionally added to the end of morning and evening services throughout the month and continues until Hoshana Rabbah. Some days, I read the entire Psalm. Other days, I focus on one or two verses that take hold of me. Additional prayers, known as Selichot, are recited during this time period as well. Sephardim recite them daily as part of morning services as a way to break down our stubbornness while Ashkenazim add them in beginning the Sunday prior to Rosh HaShanah unless Rosh HaShanah begins on or prior to a Tuesday. In which case, Selichot begin the Sunday of the preceding week. These poems of forgiveness wear us down so that all of our pretenses begin to fall away. Some people refrain from caffeine so that they are ready for the Yom Kippur fast. Others only read books on sacred topics. Or only listen to music that fits the themes of the holy days. Find what works for you. And use this time wisely.